Years ago, installing a new surveillance system often meant finding a comfortable trade-off between improved security and the amount of hardware you were willing to look at on a daily basis. Most security cameras were large, bulky devices, and few options existed for housing colors and mounts. These days, however, things have changed. It’s now possible to have both a well-functioning security product, and one that looks great at the same time. You can find a variety of surveillance cameras that are designed to blend in with your business landscape. More organizations are purchasing these products, not only because they’re less obtrusive, but also because they are full-featured IP cameras with all the same functionality as their larger, less aesthetically pleasing counterparts. Just think about how other forms of technology have evolved over the decades. When cell phones were first introduced, the clunky handheld devices barely fit in your briefcase, never mind your coat pocket. Now, mobile phones have smaller, sleek designs, and more features than we ever thought possible. I can send an email or text, take a photo, and even provision my NVR, all with my mobile device. The same trend is happening in video surveillance. 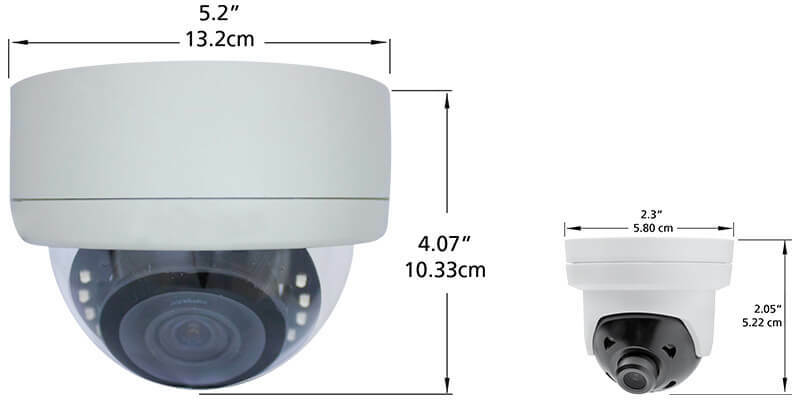 Security cameras now come in smaller sizes and are designed with a greater focus on overall aesthetic impact. And even though the camera body size may be small, many of these devices still deliver high resolution video and features like High Dynamic Range, and integrated IR LEDs for advanced nighttime surveillance. This is great news for businesses that have more modern, minimalistic designs, where a big, heavy security camera would look out of place. So how discreet are these cameras? Just look at the devices below. The discreet camera on the right, however, is half the size, at 2.3 inches in diameter. And because this camera has a modular design, its encoder can be concealed inside a ceiling or wall, so just the dome is visible. The idea here is that your video surveillance blends in with your business design. To be clear, these are not hidden cameras, but they’re not exactly overt either. Mounted to a ceiling or wall, a discreet camera can meld seamlessly with your business décor, making it a very inconspicuous form of surveillance. And there can be security advantages to that, too. While highly visible security cameras can be a deterrent to criminals, forcing them to think twice about committing a crime, discreet cameras can capture activity that might otherwise not have taken place. People act differently when they know a camera is watching; if they are unaware of the camera, you may just capture the unexpected. Are you thinking about adding a discreet camera to your business? Send us your questions or comments below.